Don't Buy The Lie! – Don't Buy The Lie! 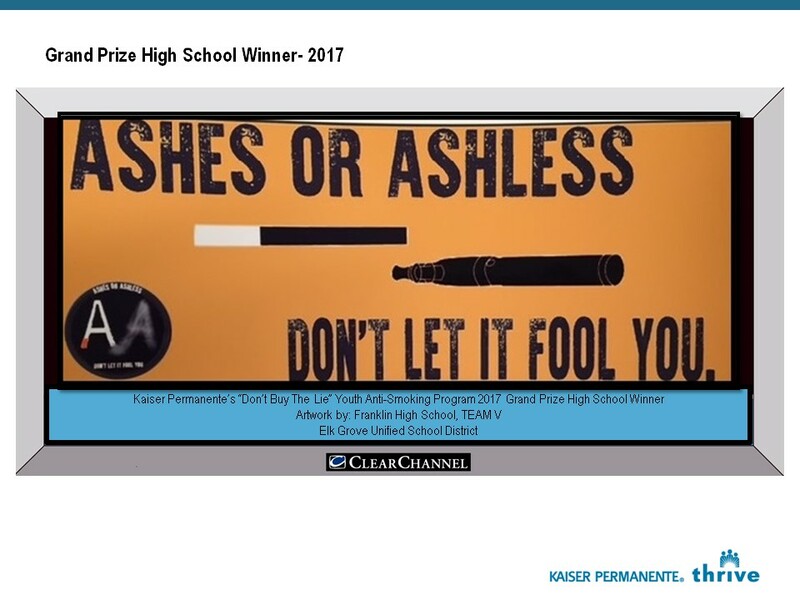 Kaiser Permanente has sponsored the “Don’t Buy The Lie” Anti Smoking Youth Education Program within the Greater Sacramento area for over 25 years. Let’s face it…the tobacco industry hasn’t given up on directly targeting our youth; they spend billions of dollars each year on advertising. Why do they do this? They know that youth are more prone to addiction than adults since their brain is growing so rapidly. That’s why youth can learn so fast…and get addicted fast. You can’t feel your brain changing, you only know when it has changed…and you can’t stop! We will not be holding school or class assemblies this year. However, we are currently scheduling more intimate Smoking Education Lunch and Learns for your staff and/or parents. Please request training for 2019, so we can schedule our visit to your school. Lunch will be provided! If you have questions about our anti-smoking program or poster contest please contact Tamara Wilgus, 916-591-9420 or, Cindy Centerwall, 916-977-3051. We will educate your staff and teachers ! Is your school interested in learning more about the Risks of Smoking and Vaping ? We are currently scheduling more intimate Smoking Education Lunch and Learns for your staff. Please request training for 2019, so we can schedule our visit to your school. 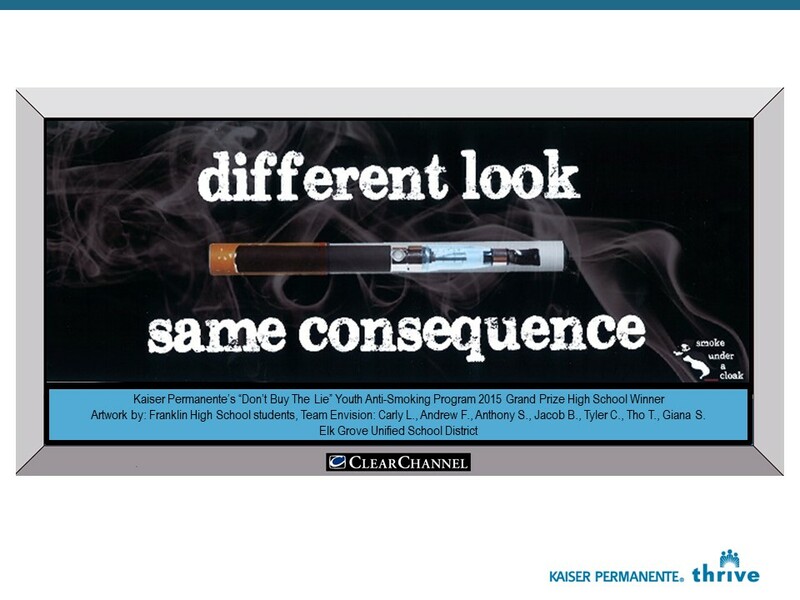 The 26th annual Kaiser Permanente Don’t Buy The Lie Anti-Smoking Poster Contest is now open! Calling all students in the 6th-12th grades! We want to hear your VOICE about the concerns vaping is having on YOUR generation to share with YOUR Peers. Your art, story, voice will be shared all over the greater Sacramento area on billboards, radio, Twitter and more! 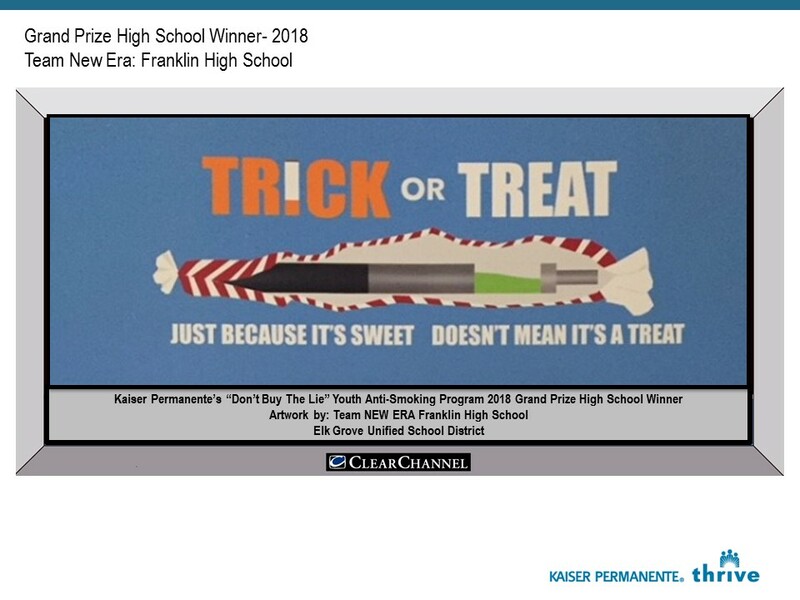 The goal for the 2019 poster contest is to uncover the truth about vaping/juuling and the effect it has on youth! We want this generation to have a Smokeless Summer and beyond! Visit www.kpdbtl.com for more details.